If you are lucky enough to live under glorious sunshine then you are already blessed with the best way to dry clothes – a clothes line. However, if you live under grey and rainy skies you probably have a tumble dryer. Few white goods are less efficient than the power hungry tumble dryer, and tumble dryers can also shrink and damage many clothes. 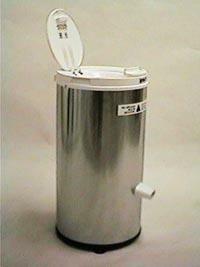 Fortunately there is an alternative: a Spin Dryer such as the Spin X Spin Dryer pictured above. When you take your washing out of the washing machine it is full of water. Put it in the Spin X Spin Dryer for three minutes and 60% of that water is removed by centrifugal force as it is spun at 3300rpm. Start up is smooth and gradual, and the drum stops from full speed in under three seconds. The electricity used during that three minute spin cycle is about the same as that used in just the first 15 seconds of a typical tumble dryer cycle. After using a spin dryer clothes can be tumbled much more efficiently, or hung out to dry completely for a much shorter time. Costing around £300 and made in Germany, this Spin Dryer will pay for itself in under three years thanks to the electricity savings it offers. Cheaper models (<£120) usually use more power and so they waste electricity and cost more over their lifetime. Other major manufacturers of spin dryers include Zanussi, Creda, Electrolux, Whirlpool, Indesit, Hoover, Hotpoint, and Bosch.